Author: Alistair Crompton. Publisher: Business Books Ltd. Originally published 1979, second edition 1987. 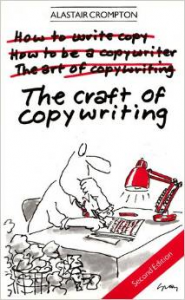 Are copywriting books from 20, 30 or 40 years ago still worth reading? When I started out in copywriting there were precious few books available to help guide me. This was one of the better ones. It’s out of print, but you can easily pick up a cheap used copy on Amazon, where they’re available for as little as a penny, plus p&p. As far as I can see, there hasn’t been a new edition since 1987, although it was reprinted several times. This of course makes some of it out of date. No internet, no social media, no mobile ads or apps, no ‘content’. It’s also focused on advertising – above the line agencies producing commercials, press ads and posters. That doesn’t mean that it’s all out of date, however. Much of it is still relevant. Other parts should be relevant, but have been forgotten in the rush to produce ever more content for ever more media ever more quickly – of a quality that’s often ever less. Your first day in the creative department – lots has changed; mostly curiosity value. The creative director – sadly in many cases this is again curiosity value. Read it to see what we’ve lost. Good habits to get into – much of this is still good advice. There are only two kinds of advertising – the two types being ads where there is something to say and ads where there isn’t. Still good if you’re creating ads; not relevant if you’re doing ‘content’ – where normally far too much is said, whether it needs saying or not. Work on what to say, not how to say it – 100% true today. Some techniques – a useful chapter this. (See also a couple of my other book reviews, which take this even further). More techniques – as above. Before/after, torture test, challenges, useful words to use, and so on. All good stuff. Still more techniques – same again, including some useful visual ones. Cinema and TV – ok but limited. This was when ‘tube’ meant the television, not something you posted videos of your cat on. Talking to the housewife – oh dear, oh dear. Let’s move swiftly on. The leap to light speed – this is about mind sets more than anything, and as such is still interesting. How to judge your work – important and still useful. How to defend your work – again, a useful chapter, even though it’s so hard to get anything half decent made nowadays. How to present your work – obviously this has dated somewhat, given email, PDFs and so forth. But still has its merits. How to live with a dead campaign – ok, but again largely overtaken by changes in the real world. In summary, as it costs so little it’s certainly worth picking up a copy. Some of the information is out-of-date, some is missing, and some is still useful. And some has been lost and deserves reappraisal. If you’re looking for a copywriter for your website, advertising or sales collateral, please get in touch. This entry was posted in Copywriting and marketing book reviews and tagged copywriting book review. Bookmark the permalink.